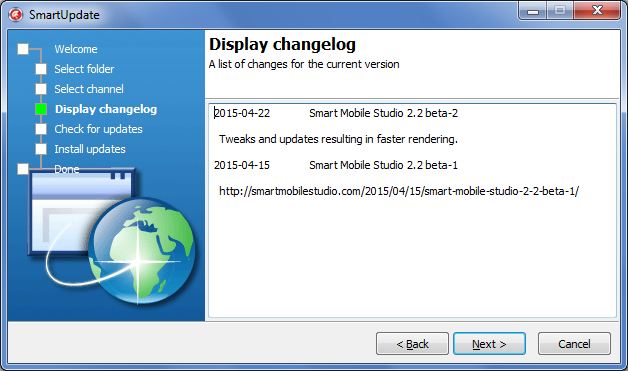 Beta-2 of Smart Mobile Studio 2.2 is now ready. If you are new to the beta program, you can just follow instructions outlined in the beta 1 announcement. If you have already installed the beta-1, then please first update the SmartUpdate program with the fresh version. We have enhanced it with two small details. Firstly, it will display the changelog for the selected channel before the download is started and secondly, it can now update itself. So from now on SmartUpdate will fetch a fresh copy of itself from the server whenever we add functionality or fix some bug. Before upgrading to the new beta, please close the Smart Mobile Studio IDE. We only changed a few critical critical files in this update, but fixes were really important so you definitely should upgrade from beta-1 to beta-2. Most importantly, we have fixed some problems with the visual library (“forms” part of the RTL) while also improving the rendering speed by a factor of 2-3x (depending on occasion an on the browser). We are very proud to announce a start of the beta cycle for the next Smart Mobile Studio release – 2.2. Amongst many other news (a full list of changes can be found at the end of this article), we are also presenting new distribution mechanism, a SmartUpdate program. With SmartUpdate you can follow different Smart Mobile Studio distribution channels. At the moment, Beta is the only distribution channel but this will most probably change after the 2.2 is released. We plan to introduce at least a Stable channel that would distribute stable releases. Of course, you’ll still be able to use the standard distribution mechanism – the installer – for stable releases but betas will only be released via the SmartUpdate. Another big change in the 2.2 beta is that you can install it into a single folder. You can also run it from that folder and it will not interfere with other (stable) Smart installation on the same computer. This will greatly simplify the testing. Also, if you want to test Smart on different computers, you can just make a copy of that folder.